For reader help on ISBNs, see Help:ISBN. The International Standard Book Number (ISBN) is a numeric commercial book identifier which is intended to be unique. [a][b] Publishers purchase ISBNs from an affiliate of the International ISBN Agency. An ISBN is assigned to each edition and variation (except reprintings) of a book. For example, an e-book, a paperback and a hardcover edition of the same book would each have a different ISBN. The ISBN is 13 digits long if assigned on or after 1 January 2007, and 10 digits long if assigned before 2007. The method of assigning an ISBN is nation-based and varies from country to country, often depending on how large the publishing industry is within a country. The initial ISBN identification format was devised in 1967, based upon the 9-digit Standard Book Numbering (SBN) created in 1966. The 10-digit ISBN format was developed by the International Organization for Standardization (ISO) and was published in 1970 as international standard ISO 2108 (the SBN code can be converted to a ten-digit ISBN by prefixing it with a zero digit “0”). Privately published books sometimes appear without an ISBN. The International ISBN agency sometimes assigns such books ISBNs on its own initiative. Another identifier, the International Standard Serial Number (ISSN), identifies periodical publications such as magazines and newspapers. The International Standard Music Number (ISMN) covers musical scores. The Standard Book Numbering (SBN) code is a 9-digit commercial book identifier system created by Gordon Foster, Emeritus Professor of Statistics at Trinity College, Dublin, for the booksellers and stationers WHSmith and others in 1965. The ISBN identification format was conceived in 1967 in the United Kingdom by David Whitaker (regarded as the “Father of the ISBN”) and in 1968 in the United States by Emery Koltay (who later became director of the U.S. ISBN agency R.R. Bowker). The 10-digit ISBN format was developed by the International Organization for Standardization (ISO) and was published in 1970 as international standard ISO 2108. The United Kingdom continued to use the 9-digit SBN code until 1974. ISO has appointed the International ISBN Agency as the registration authority for ISBN worldwide and the ISBN Standard is developed under the control of ISO Technical Committee 46/Subcommittee 9 TC 46/SC 9. The ISO on-line facility only refers back to 1978. An SBN may be converted to an ISBN by prefixing the digit “0”. For example, the second edition of Mr. J. G. Reeder Returns, published by Hodder in 1965, has “SBN 340 01381 8” – 340 indicating the publisher, 01381 their serial number, and 8 being the check digit. This can be converted to ISBN 0-340-01381-8; the check digit does not need to be re-calculated. Since 1 January 2007, ISBNs have contained 13 digits, a format that is compatible with “Bookland” European Article Number EAN-13s. The parts of a 10-digit ISBN and the corresponding EAN‑13 and barcode. Note the different check digits in each. The part of the EAN‑13 labeled “EAN” is the Bookland country code. a checksum character or check digit. A 13-digit ISBN can be separated into its parts (prefix element, registration group, registrant, publication and check digit), and when this is done it is customary to separate the parts with hyphens or spaces. Separating the parts (registration group, registrant, publication and check digit) of a 10-digit ISBN is also done with either hyphens or spaces. Figuring out how to correctly separate a given ISBN is complicated, because most of the parts do not use a fixed number of digits. ISBN is most often used among others special identifiers to describe references in Wikipedia and can help to find the same sources with different description in various language versions (for example different spelling of the title or authors depending on language). The ISBN registration group identifier is a 1- to 5-digit number that is valid within a single prefix element (i.e. one of 978 or 979), and can be separated between hyphens, such as “978-1-…”. Registration group identifiers have primarily been allocated within the 978 prefix element. The single-digit group identifiers within the 978-prefix element are: 0 or 1 for English-speaking countries; 2 for French-speaking countries; 3 for German-speaking countries; 4 for Japan; 5 for Russian-speaking countries; and 7 for People’s Republic of China. An example 5-digit group identifier is 99936, for Bhutan. The allocated group IDs are: 0–5, 600–622, 65, 7, 80–94, 950–989, 9920–9989, and 99901–99981. Books published in rare languages typically have longer group identifiers. Within the 979 prefix element, the registration group identifier 0 is reserved for compatibility with International Standard Music Numbers (ISMNs), but such material is not actually assigned an ISBN. The registration group identifiers within prefix element 979 that have been assigned are 10 for France, 11 for the Republic of Korea, and 12 for Italy. The original 9-digit standard book number (SBN) had no registration group identifier, but prefixing a zero (0) to a 9-digit SBN creates a valid 10-digit ISBN. The national ISBN agency assigns the registrant element (cf. Category:ISBN agencies) and an accompanying series of ISBNs within that registrant element to the publisher; the publisher then allocates one of the ISBNs to each of its books. In most countries, a book publisher is not required by law to assign an ISBN; however, most bookstores only handle ISBN bearing publications. A listing of more than 900,000 assigned publisher codes is published, and can be ordered in book form (€1399, US$1959). The web site of the ISBN agency does not offer any free method of looking up publisher codes. Partial lists have been compiled (from library catalogs) for the English-language groups: identifier 0 and identifier 1. Publishers receive blocks of ISBNs, with larger blocks allotted to publishers expecting to need them; a small publisher may receive ISBNs of one or more digits for the registration group identifier, several digits for the registrant, and a single digit for the publication element. Once that block of ISBNs is used, the publisher may receive another block of ISBNs, with a different registrant element. Consequently, a publisher may have different allotted registrant elements. There also may be more than one registration group identifier used in a country. This might occur once all the registrant elements from a particular registration group have been allocated to publishers. By using variable block lengths, registration agencies are able to customise the allocations of ISBNs that they make to publishers. For example, a large publisher may be given a block of ISBNs where fewer digits are allocated for the registrant element and many digits are allocated for the publication element; likewise, countries publishing many titles have few allocated digits for the registration group identifier and many for the registrant and publication elements. Here are some sample ISBN-10 codes, illustrating block length variations. 0-85131-041-9 English-speaking area J. A. Allen & Co.
93-86954-21-4 English-speaking area Edupedia Publications Pvt Ltd.
A check digit is a form of redundancy check used for error detection, the decimal equivalent of a binary check bit. It consists of a single digit computed from the other digits in the number. The method for the ten-digit code is an extension of that for SBNs, the two systems are compatible, and SBN prefixed with “0” will give the same check-digit as without – the digit is base eleven, and can be 0–9 or X. The system for thirteen-digit codes is not compatible and will, in general, give a different check digit from the corresponding 10-digit ISBN, and does not provide the same protection against transposition. This is because the thirteen-digit code was required to be compatible with the EAN format, and hence could not contain an “X”. According to the 2001 edition of the official manual of the International ISBN Agency, the ISBN-10 check digit – which is the last digit of the ten-digit ISBN – must range from 0 to 10 (the symbol X is used for 10), and must be such that the sum of all the ten digits, each multiplied by its (integer) weight, descending from 10 to 1, is a multiple of 11. The two most common errors in handling an ISBN (e.g., typing or writing it) are a single altered digit or the transposition of adjacent digits. It can be proven that all possible valid ISBN-10s have at least two digits different from each other. It can also be proven that there are no pairs of valid ISBN-10s with eight identical digits and two transposed digits. (These are true only because the ISBN is less than 11 digits long, and because 11 is a prime number.) The ISBN check-digit method therefore ensures that it will always be possible to detect these two most common types of error, i.e., if either of these types of error has occurred, the result will never be a valid ISBN – the sum of the digits multiplied by their weights will never be a multiple of 11. However, if the error occurs in the publishing house and goes undetected, the book will be issued with an invalid ISBN. In contrast, it is possible for other types of error, such as two altered non-transposed digits, or three altered digits, to result in a valid ISBN (although it is still unlikely). Each of the first nine digits of the ten-digit ISBN—excluding the check digit itself—is multiplied by its (integer) weight, descending from 10 to 2, and the sum of these nine products found. The value of the check digit is simply the one number between 0 and 10 which, when added to this sum, means the total is a multiple of 11. Adding 2 to 130 gives a multiple of 11 (132 = 12 x 11) − this is the only number between 0 and 10 which does so. Therefore, the check digit has to be 2, and the complete sequence is ISBN 0-306-40615-2. The value required to satisfy this condition might be 10; if so, an ‘X’ should be used. Thus the check digit is 2. The modular reduction can be done once at the end, as shown above (in which case s could hold a value as large as 496, for the invalid ISBN 99999-999-9-X), or s and t could be reduced by a conditional subtract after each addition. The 2005 edition of the International ISBN Agency’s official manual describes how the 13-digit ISBN check digit is calculated. The ISBN-13 check digit, which is the last digit of the ISBN, must range from 0 to 9 and must be such that the sum of all the thirteen digits, each multiplied by its (integer) weight, alternating between 1 and 3, is a multiple of 10. The calculation of an ISBN-13 check digit begins with the first 12 digits of the thirteen-digit ISBN (thus excluding the check digit itself). Each digit, from left to right, is alternately multiplied by 1 or 3, then those products are summed modulo 10 to give a value ranging from 0 to 9. Subtracted from 10, that leaves a result from 1 to 10. A zero (0) replaces a ten (10), so, in all cases, a single check digit results. Thus, the check digit is 7, and the complete sequence is ISBN 978-0-306-40615-7. In general, the ISBN-13 check digit is calculated as follows. This check system – similar to the UPC check digit formula – does not catch all errors of adjacent digit transposition. Specifically, if the difference between two adjacent digits is 5, the check digit will not catch their transposition. For instance, the above example allows this situation with the 6 followed by a 1. The correct order contributes 3×6+1×1 = 19 to the sum; while, if the digits are transposed (1 followed by a 6), the contribution of those two digits will be 3×1+1×6 = 9. However, 19 and 9 are congruent modulo 10, and so produce the same, final result: both ISBNs will have a check digit of 7. The ISBN-10 formula uses the prime modulus 11 which avoids this blind spot, but requires more than the digits 0–9 to express the check digit. Additionally, if the sum of the 2nd, 4th, 6th, 8th, 10th, and 12th digits is tripled then added to the remaining digits (1st, 3rd, 5th, 7th, 9th, 11th, and 13th), the total will always be divisible by 10 (i.e., end in 0). An ISBN-10 is converted to ISBN-13 by prepending “978” to the ISBN-10 and recalculating the final checksum digit using the ISBN-13 algorithm. The reverse process can also be performed, but not for numbers commencing with a prefix other than 978, which have no 10 digit equivalent. Publishers and libraries have varied policies about the use of the ISBN check digit. Publishers sometimes fail to check the correspondence of a book title and its ISBN before publishing it; that failure causes book identification problems for libraries, booksellers, and readers. For example, ISBN 0-590-76484-5 is shared by two books – Ninja gaiden®: a novel based on the best-selling game by Tecmo (1990) and Wacky laws (1997), both published by Scholastic. Most libraries and booksellers display the book record for an invalid ISBN issued by the publisher. The Library of Congress catalogue contains books published with invalid ISBNs, which it usually tags with the phrase “Cancelled ISBN”. However, book-ordering systems such as Amazon.com will not search for a book if an invalid ISBN is entered to its search engine. OCLC often indexes by invalid ISBNs, if the book is indexed in that way by a member library. Only the term “ISBN” should be used; the terms “eISBN” and “e-ISBN” have historically been sources of confusion and should be avoided. If a book exists in one or more digital (e-book) formats, each of those formats must have its own ISBN. In other words, each of the three separate EPUB, Amazon Kindle, and PDF formats of a particular book will have its own specific ISBN. They should not share the ISBN of the paper version, and there is no generic “eISBN” which encompasses all the e-book formats for a title. Currently the barcodes on a book’s back cover (or inside a mass-market paperback book’s front cover) are EAN-13; they may have a separate barcode encoding five digits called an EAN-5 for the currency and the recommended retail price. 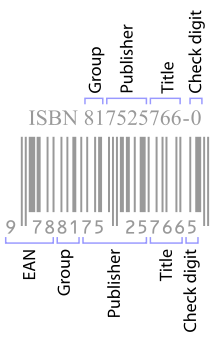 For 10-digit ISBNs, the number “978”, the Bookland “country code”, is prefixed to the ISBN in the barcode data, and the check digit is recalculated according to the EAN13 formula (modulo 10, 1x and 3x weighting on alternating digits). Partly because of an expected shortage in certain ISBN categories, the International Organization for Standardization (ISO) decided to migrate to a thirteen-digit ISBN (ISBN-13). The process began 1 January 2005 and was planned to conclude 1 January 2007. As of 2011, all the 13-digit ISBNs began with 978. As the 978 ISBN supply is exhausted, the 979 prefix was introduced. Part of the 979 prefix is reserved for use with the Musicland code for musical scores with an ISMN. The 10-digit ISMN codes differed visually as they began with an “M” letter; the bar code represents the “M” as a zero (0), and for checksum purposes it counted as a 3. All ISMNs are now 13 digits commencing 979–0; 979–1 to 979–9 will be used by ISBN. Publisher identification code numbers are unlikely to be the same in the 978 and 979 ISBNs, likewise, there is no guarantee that language area code numbers will be the same. Moreover, the ten-digit ISBN check digit generally is not the same as the thirteen-digit ISBN check digit. Because the GTIN-13 is part of the Global Trade Item Number (GTIN) system (that includes the GTIN-14, the GTIN-12, and the GTIN-8), the 13-digit ISBN falls within the 14-digit data field range. Barcode format compatibility is maintained, because (aside from the group breaks) the ISBN-13 barcode format is identical to the EAN barcode format of existing 10-digit ISBNs. So, migration to an EAN-based system allows booksellers the use of a single numbering system for both books and non-book products that is compatible with existing ISBN based data, with only minimal changes to information technology systems. Hence, many booksellers (e.g., Barnes & Noble) migrated to EAN barcodes as early as March 2005. Although many American and Canadian booksellers were able to read EAN-13 barcodes before 2005, most general retailers could not read them. The upgrading of the UPC barcode system to full EAN-13, in 2005, eased migration to the ISBN-13 in North America. ^ Occasionally, publishers erroneously assign an ISBN to more than one title—the first edition of The Ultimate Alphabet and The Ultimate Alphabet Workbook have the same ISBN, 0-8050-0076-3. Conversely, books are published with several ISBNs: A German second-language edition of Emil und die Detektive has the ISBNs 87-23-90157-8 (Denmark), 0-8219-1069-8 (United States), 91-21-15628-X (Sweden), 0-85048-548-7 (United Kingdom) and 3-12-675495-3 (Germany). ^ In some cases, books sold only as sets share ISBNs. For example, the Vance Integral Edition used only two ISBNs for 44 books. ^ “The International ISBN Agency”. Retrieved 20 February 2018. ^ Bradley, Philip (1992). “Book numbering: The importance of the ISBN” (PDF (245KB)). The Indexer. 18 (1): 25–26. ^ Foster, Gordon (1966). “INTERNATIONAL STANDARD BOOK NUMBERING (ISBN) SYSTEM original 1966 report”. informaticsdevelopmentinstitute.net. Archived from the original on 30 April 2011. Retrieved 20 April 2014. ^ a b “ISBN History”. isbn.org. 20 April 2014. Archived from the original on 20 April 2014. Retrieved 20 April 2014. ^ a b c d Manwal ghall-Utenti tal-ISBN (PDF) (in Maltese) (6th ed.). Malta: Kunsill Nazzjonali tal-Ktieb. 2016. p. 5. ISBN 978-99957-889-4-0. Archived from the original (PDF) on 17 August 2016. ^ US ISBN Agency. “Bowker.com – Products”. Commerce.bowker.com. Retrieved 11 June 2015. ^ Gregory, Daniel. “ISBN”. PrintRS. Archived from the original on 16 May 2016. Retrieved 11 June 2015. ^ a b c d e International ISBN Agency (2012). ISBN Users’ manual (PDF). isbn-international.org (Sixth International ed.). pp. 7, 23. ISBN 978-92-95055-02-5. Archived (PDF) from the original on 29 April 2014. Retrieved 29 April 2014. ^ Some books have several codes in the first block: e.g. A. M. Yaglom’s Correlation Theory…, published by Springer Verlag, has two ISBNs, 0-387-96331-6 and 3-540-96331-6. Though Springer’s 387 and 540 codes are different for English (0) and German (3); the same item number 96331 produces the same check digit: 6. Springer uses 431 as their publisher code for Japanese (4) and 4-431-96331-? would also have check digit ? = 6. Other Springer books in English have publisher code 817, and 0-817-96331-? would also get check digit ? = 6. This suggests special considerations were made for assigning Springer’s publisher codes, as random assignments of different publisher codes would not lead the same item number to get the same check digit every time. Finding publisher codes for English and German, say, with this effect amounts to solving a linear equation in modular arithmetic. ^ The International ISBN agency’s ISBN User’s Manual says: “The ten-digit number is divided into four parts of variable length, which must be separated clearly, by hyphens or spaces” although omission of separators is permitted for internal data processing. If present, hyphens must be correctly placed; see ISBN hyphenation definition. The actual definition for hyphenation contains more than 220 different registration group elements with each one broken down into a few to several ranges for the length of the registrant element (more than 1,000 total). The document defining the ranges, listed by agency, is 29 pages. ^ Lewoniewski, Włodzimierz; Węcel, Krzysztof; Abramowicz, Witold (23 September 2017). “Analysis of References Across Wikipedia Languages”. Communications in Computer and Information Science. 756: 561–573. doi:10.1007/978-3-319-67642-5_47. Retrieved 13 January 2019. ^ Halfaker, Aaron; Taraborelli, Dario (2017): Scholarly article citations in Wikipedia. figshare. Dataset. ^ Canada, Library and Archives. “ISBN Canada”. www.bac-lac.gc.ca. Retrieved 19 January 2016. ^ “Find an agency – International ISBN Agency”. www.isbn-international.org. ^ “About the U.S. ISBN Agency”. ^ “Bowker – ISBN”. Thorpe-Bowker. 5 January 2009. Retrieved 29 March 2012. ^ “TABELA DE PREÇOS DOS SERVIÇOS”. Biblioteca Nacional, Government of Brazil. Retrieved 8 September 2015. ^ “Introduction to Books Registration”. Hong Kong Public Libraries. Retrieved 12 January 2017. ^ “Union HRD Minister Smt. Smriti Zubin Irani Launches ISBN Portal”. ^ “How to get ISBN in India”. ^ “What is an ISBN ?”. ICL – מרכז הספר והספריות. 7 April 2015. ^ “ISBN – Chi siamo e contatti” [ISBN – Who we are and contacts] (in Italian). EDISER srl. Retrieved 3 January 2015. ^ “ISBN – Tariffe Servizi ISBN” [ISBN Service Tariffs] (in Italian). EDISER srl. Retrieved 3 January 2015. ^ “ISBN”. Kunsill Nazzjonali tal-Ktieb. 2016. Archived from the original on 23 October 2016. ^ Manwal ghall-Utenti tal-ISBN (PDF) (in Maltese) (6th ed.). Malta: Kunsill Nazzjonali tal-Ktieb. 2016. pp. 1–40. ISBN 978-99957-889-4-0. Archived from the original (PDF) on 17 August 2016. ^ “Gazzetta tal-Gvern ta’ Malta” (PDF). Government Gazette. 23 January 2015. p. 582. Archived from the original (PDF) on 23 November 2016. ^ “ISBNs, ISSNs, and ISMNs”. National Library of New Zealand. New Zealand Government. Retrieved 19 January 2016. ^ “International Standard Book Number”. National Library of the Philippines. Retrieved 25 December 2017. ^ “ISBN – Kültür ve Turizm Bakanlığı Kütüphaneler ve Yayımlar Genel Müdürlüğü OS”. ekygm.gov.tr. ^ “Nielsen UK ISBN Agency”. Nielsen UK ISBN Agency. Retrieved 2 January 2015. ^ “Bowker – ISBN”. RR Bowker. 8 March 2013. Retrieved 8 March 2013. ^ “ISBN Ranges”. isbn-international.org. 29 April 2014. Select the format you desire and click on the Generate button. Archived from the original on 29 April 2014. Retrieved 29 April 2014. ^ See a complete list of group identifiers. ISBN.org sometimes calls them group numbers. Their table of identifiers now refers to ISBN prefix ranges, which must be assumed to be group identifier ranges. ^ Hailman, Jack Parker (2008). Coding and redundancy: man-made and animal-evolved signals. Harvard University Press. p. 209. ISBN 978-0-674-02795-4. ^ International ISBN Agency (5 December 2014). “International ISBN Agency – Range Message (pdf sorted by prefix)” (PDF). isbn-international.org. p. 29. Retrieved 15 December 2014. ^ Splane, Lily (2002). The Book Book: A Complete Guide to Creating a Book on Your Computer. Anaphase II Publishing. p. 37. ISBN 978-0-945962-14-4. ^ “ISBN Ranges”. isbn-international.org. International ISBN Agency. 15 September 2014. Retrieved 15 September 2014. ^ “The International ISBN Agency – International ISBN Agency”. www.isbn-international.org. ^ “ISBN Users’ Manual – 4. Structure of ISBN”. Isbn.org. Archived from the original on 22 May 2013. Retrieved 27 May 2013. ^ For example, I’saka: a sketch grammar of a language of north-central New Guinea. Pacific Linguistics. ISBN “0-85883-554-4”. ^ Lorimer, Rowland; Shoichet, Jillian; Maxwell, John W. (2005). Book Publishing I. CCSP Press. p. 299. ISBN 978-0-9738727-0-5. ^ 020 – International Standard Book Number (R) – MARC 21 Bibliographic – Full. Library of Congress. ^ “The Myth of the eISBN Why Every eBook Edition Needs a Unique Number – Publishing services for self publishing authors and businesses”. Publishing services for self publishing authors and businesses. 28 June 2013. Retrieved 16 January 2017. ^ Frequently asked questions, US: ISBN, 12 March 2014, archived from the original on 16 April 2014 — including a detailed description of the EAN-13 format. ^ “xISBN (Web service)”. Xisbn.worldcat.org. Archived from the original on 1 May 2011. Retrieved 27 May 2013. “Are You Ready for ISBN-13?”. R. R. Bowker LLC.